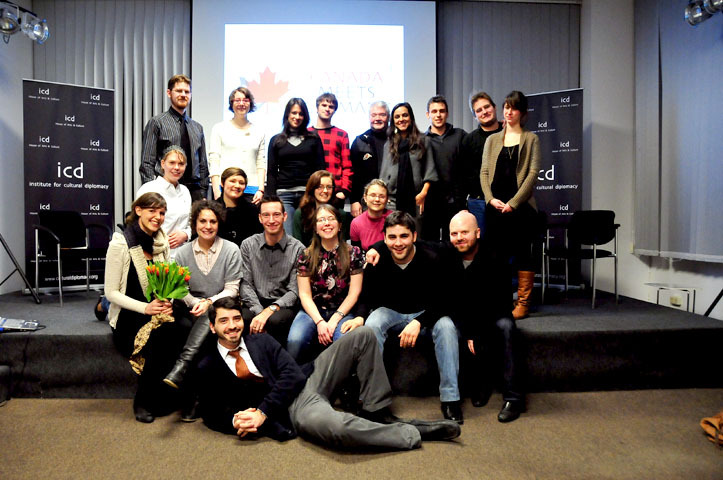 The six day conference for “Germany Meets Canada: A Forum For Young Leaders” took place in Berlin from the 7th to the 13th of March 210. The conference examined the following subjects: the bilateral relations between Canada and Germany, transatlantic partnerships, the difference in approaches to immigration policies, and co-operative efforts on climate change. In addition to these issues, the conference also looked at the unique relationship between the province of Quebec and Germany, German foreign policy towards Canada, and a comparison and contrast of strategies for attracting international students. Other leadership initiatives for young leaders were explored as the participants took part in several case studies and also worked on their own leadership projects in team building activities. Amongst the forum speakers for the six-day event were leading political figures in Canadian and German relations, media, academia, and cultural Attachés. Upon the conclusion of the conference, participants were given an official certificate of attendance, which provided details of the speakers who took part in the Canada Meets Germany Program, and the topics discussed. Monday March 8th, 2010: The conference began at the Deutsche-Welle with a discussion on the role of sports as Cultural Diplomacy and the 2010 Winter Olympics. The participants were then given a tour of the Deutsche-Welle TV studios, and they later reconvened at the ICD House to hear a presentation from ICD Founder Mark Donfried on cultural diplomacy. The day concluded with an interesting presentation by Murray Small Legs who discussed aboriginal history in Canada. Tuesday March 9th, 2010: The second day of the forum began at the Quebec Office. The participants looked at Quebec’s relationship with Germany, and Quebec’s image abroad. This was followed by a lecture given by Agnes Kolodziej who gave a comprehensive overview of the state of relations between both countries, covering the political, commercial, and cultural issues that both Canada and Germany communicate on regularly. The group then heard a presentation from Peter Rees who discussed leadership initiatives, where the participants then worked in groups to formulate their own ideas. Wednesday March 10th, 2010: The third day started at the Bundeszentrale für Politische Bildung. The first theme was European identity in a Canadian context and how both sides could learn from each other’s policies. The participants then returned to the ICD where they formed groups and worked on several case studies looking at Canadian-German economic relations. This was followed by a lecture by Niels Klabunde, a Junior Researcher at the Center of Excellence for Research on Immigration and Diversity who discussed comparative responses to migrant economies in both Canada and Germany. The day concluded with a brief presentation by alumni members of the Canada Meets Germany study tour which looks to expand its network, and discussed their experience on the CMG study tour. Thursday March 11th, 2010: The day began with a meeting at the Auswärtiges Amt which looked at German-Canadian political relations from a German perspective and covered topics such as immigration, economics, education, and culture. The participants then made their way to the Deutsche Gesellschaft für Auswärtige Politik for a panel discussion. The discussion covered India and China’s rise in power, Canada and Germany’s role in Afghanistan, and both countries’ contributions to human security in contemporary political affairs. The panel discussion was then followed by a brief, but engaging question and answer session. Friday March 12th, 2010: The final day of the CMG conference began at the Reichstag where participants were given a tour and then heard a lecture from Uli Finkenbusch discussing the public perceptions of the Afghan war from a German perspective. The participants then took part in a walking tour of Berlin where they reconvened at the ICD House to partake in an interactive presentation about art as Cultural Diplomacy from program director Sophie Roehrig. After the presentation, all participants received their certificates of attendance and had one last good bye. Sporting events such as the World Cup and the Olympics are a great platform, not only for competition, but also for cultural understanding and global unity. In the wake of the Winter Olympics, Canada has done a great job in enhancing its image in the eyes of the world. The Blackfoot Nation, along with many other aboriginal groups throughout Canada, have had to overcome many problems as a minority over the last two centuries. Dramatic socioeconomic progress has been made within the native community over the past century, but challenges still remain to this day. The aboriginal population of Canada should not be overlooked as they are an important part of Canada’s fabric as a nation. This is gradually happening, and the opening ceremonies of the Olympics did a tremendous job showcasing Canada’s aboriginal history and culture. The Blackfoot culture has experienced a renaissance. The province of Quebec and Germany have a very active and unique relationship. Many artists come to Berlin, and they have the support of both the Quebec and German governments. Quebec and Bavaria have a very close relationship economically and culturally as both sides share a very similar background. In addition to cultural initiatives, there are also strong economic ties as BOMBARDIER’S European headquarters is located in Berlin, and they have many working agreements with the Deutsche Bahn. Canadian and German relations are very close and both sides work closely on many issues, but there is room for the relationship to grow if the two countries work bilaterally on more issues. There is great economic and trade potential between Canada and the EU, but both sides must be willing to make concessions for the agreement to work. It is very difficult to implement policies and legislation among the EU because at times it operates as an “Old Boys” club where some states seem to be privileged while others are marginalised. Bringing Turkey into the EU may reduce the power, strength, and legitimacy of the EU as it is financially stretched at the moment, and even recent members have not been fully integrated yet. The EU expanded too fast, and as a result will have weak states within the union. The financial crisis has exacerbated this problem because, in the wake of the financial crisis, they required financial bailouts from the European Union. Canada has programs (Canada Experience Class) to ensure that many of their foreign students who have studied in Canada stay and make a living there, while major challenges still exist in retaining skilled graduates in Germany. Attracting skilled foreign labour is a priority for Germany as they have an aging work force, however challenges remain mainly in terms of language barriers, and some students do not feel welcome. Integration of foreign residents, particularly the Turkish community is a major challenge within Germany as many Turkish immigrants struggle with language and social barriers. In Canada, there are many programmes that are put in place to help foreign residents adapt and integrate on a socioeconomic level. Canada will begin to wind down its military exercise in Afghanistan in 2011, but a withdrawal may leave areas vulnerable where years of work and effort took place. The public in both Canada and Germany have expressed a strong desire to withdraw military forces in Afghanistan. Canada and Germany are leaders respectively in global peacekeeping missions, and despite the military presence of both countries, their humanitarian and socioeconomic efforts in Afghanistan must not be overlooked. The public sentiment in Canada and Germany regarding the conflict in Afghanistan is very similar. It has changed significantly over time as most of the public supported the idea of military involvement in Afghanistan shortly after 9/11, but public support has waned in recent years. ‘Soft power’ will not only foster cultural accessibility, but it will also make democracy more appealing to Afghans and enhance safety and stability within the region. There is a very dynamic artistic relationship between Canada and Germany as many dance and ballet troupes tour through each other’s countries and promote cultural awareness and understanding.